For his final-year project, Cameron invented an information system 'Travel LIVE' - designed to give London Underground commuters all the information they need, including which carriage is the least packed - all through a projector. Using new and existing infrastructure, Cameron devised a method of informing customers of the best place on the platform to wait for a train, in order to board the least congested carriages which in turn will ease delays in busy periods. 'Travel LIVE' was launched in June at FIND, LSBU's annual design degree show, which showcases the work of the 2013 design graduates from the diverse range of design courses available at LSBU. During his studies, Cameron started working for LSBU as a Junior Graphic Designer, where he is currently expanding his portfolio with print-based graphic design work: "I really enjoyed my time at LSBU", Cameron says. "London was a great choice for me personally, and I'm glad I didn't go to a campus-based university. In London there's always something going on and having my university right in the middle of it all was a really great experience." "I originally applied to study Computer Aided Design, then in my first year of Product Design almost left to study Graphic Design, then I spent the next year wishing I had studied Paramedic Science", Cameron says. "I'm glad I stuck to my guns though. The Product Design course at LSBU has given me a wealth of knowledge and connections in the industry, and I'm really happy with where my career is heading now." 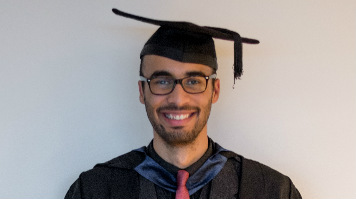 Cameron was awarded his first class honours degree in BSc (Hons) Product Design at LSBU's Faculty of Engineering, Science and the Built Environment graduation ceremony on Monday 14 October. The ceremony took place in the heritage-listed Royal Festival Hall, one of the world's elite event venues, situated in the Southbank Centre near LSBU's London campus.